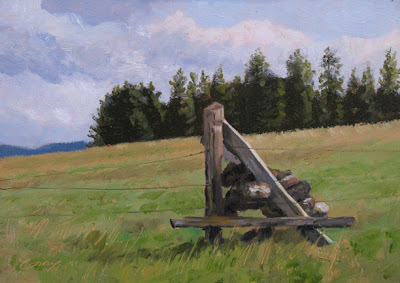 Back in April I posted a painting of a rock jack--a triangular wooden structure weighted with rocks. 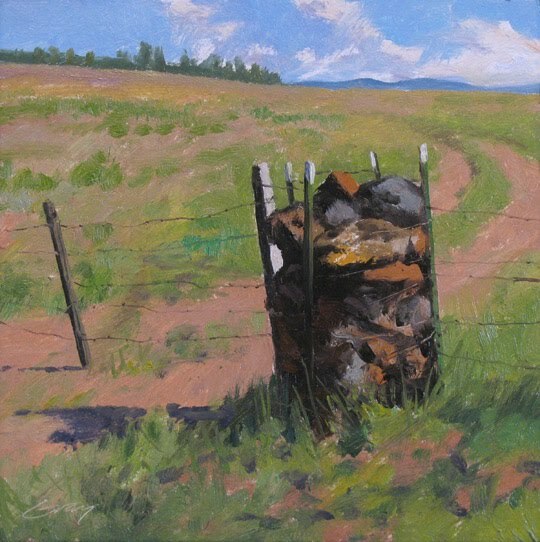 They are used in hard, rocky ground out west as deadweights for stretching wire fence. If they are built like this one, with a series of posts forming a square or circle with wire wrapped around to contain the rocks, they are called rock cribs. The cribs are heavier and are generally used to anchor corners, or breaks in the fence, such as this gate. Something hot and dry -- how fitting! But this crib looks much better hot and dry than I do. Nice painting! I've never seen a rock crib before-looks like a very practical fencing solution. Monet used the same contrast of pinks and greens in his landscapes to create the "brown" earth. Puts you in nice company, eh? Sorry Don -- didn't mean to post anonymously. It reminds me of the trails in Sedona. Those were all over the place there. Love the light in the sky. I'm also back to painting, and you can see a new pic of Winslow I did. Martyn--I appreciate your thoughts--thank you. Thanks Sam. Yes it's finally pretty hot and dry here. Same in Colorado? Thanks, Leslie. It's sure practical in those areas where there's more rocks than soil. Thanks, Bri. You're back to painting like fury! Love "3 Ring Winslow." Dynamite Don! Great palette and composition! Thanks, Cooper! Nice to hear from you. Great colors and composition! I've never seen a rock crib so I really found this interesting. Love your work! Such unique subject matter, Don! Dean, I'm glad to hear from you--thanks!